C’mon Nadine!! That VV necklace makes the outfit! Nadine is busy this week with The Good 100 Experiment. It blows my mind to learn about all the growth and movement happening in Edmonton and area because of people like Nadine and all the others attending the upcoming Good 100 weekend workshop and gathering. I know I take it for granted that people are working hard to make our community a better place so let me take this opportunity to say THANK YOU! We can all do our part, and if you’d like to get involved in The Good 100 Experiment, consider getting tickets to the Saturday night party – a fab party and a chance to mingle with great people! Though workshop registration is now closed, Good 100 workshops will be held annually, so keep up to date by signing up for Nadine’s mailing list or The Local Good mailing list. Every little bit of good helps including shopping second-hand whenever possible. 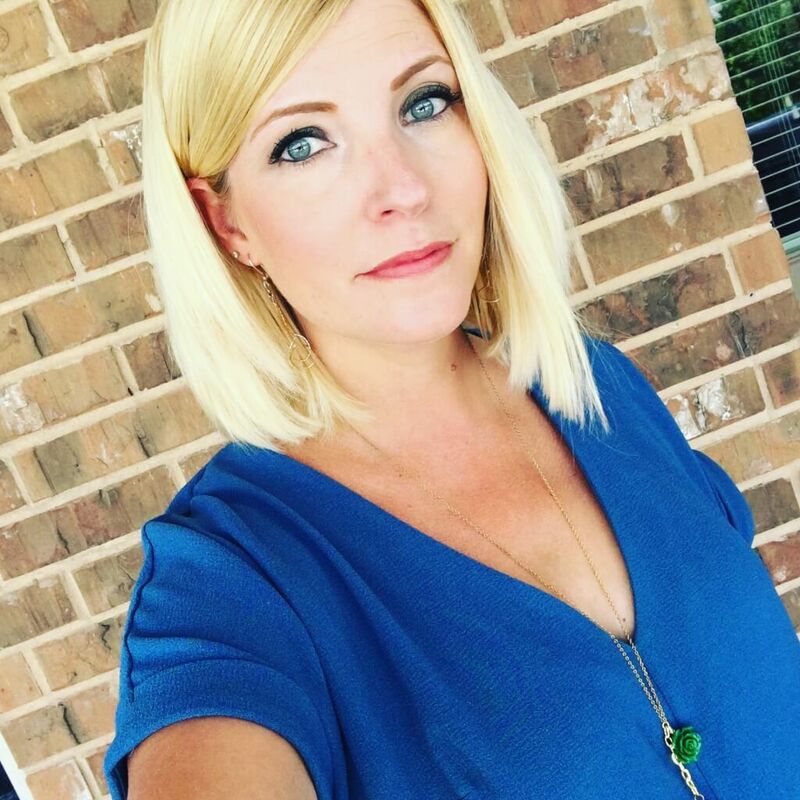 Though I usually feature clothing on VV Boutique Style, I shop second hand for my children, my husband and my home. I have thrifted swimwear, outerwear and even underwear – yes, I really did it. If you can wash it, why not? I also donate regularly to Value Village and support other local second-hand stores including the Hope Missions Bargain Shoppe. I often hear people arguing about where to shop second-hand; no matter where you shop second-hand, the community and environment will benefit in some way. So strive to be a conscious consumer and shop accordingly. Obviously, Nadine has a lot on her mind besides fashion, but it doesn’t hurt to look good while doing good! 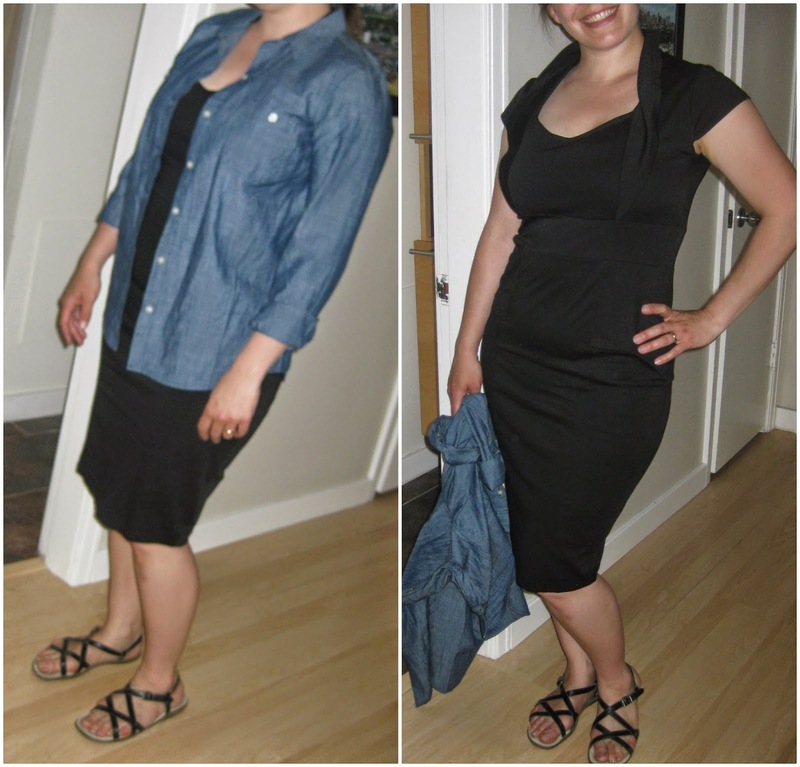 I found some wardrobe staples for her recently including a chambray shirt and boyfriend jeans. And a multi-strand necklace because I can’t let it go. Nadine,even if the term “chambray” is a little pretentious, this top has amazing versatility that can stretch a small wardrobe like yours. 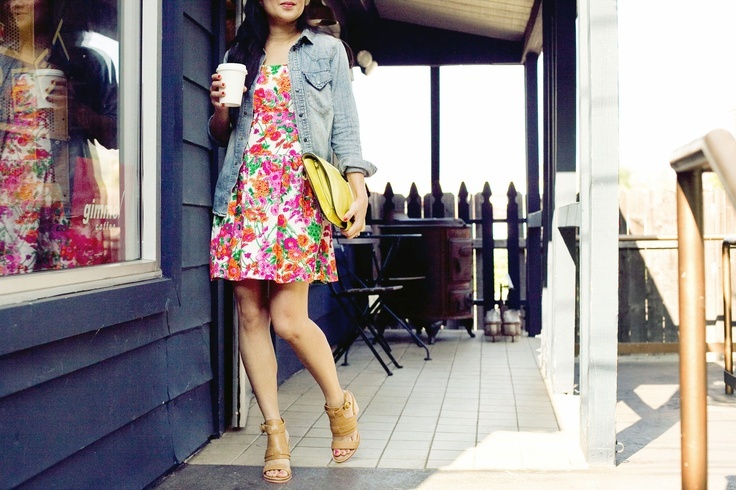 Here are some ways to style them so you can save your energy for doing more good! You may not believe me Nadine, but a chambray denim shirt over a simple black dress is a happening look! She scored this black dress with collar and empire-wasit detailing last time we shopped. You can also wear it over that brown printed dress like this. Latte optional. Or under any of your sheath-style dresses! Boyfriend jeans rolled + any tee + any blazer + any bag + any shoes = nice outfit. You can even wear your boyfriend jeans and your chambray together. What do you think Nadine? I can’t turn off the client-centered OT inside of me so what I really care about is that Nadine, Chantel and Sherry – along with every woman – find pieces they love that they feel comfortable in! 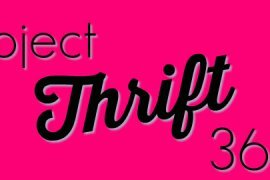 That is where thrifting and personal style come together best! 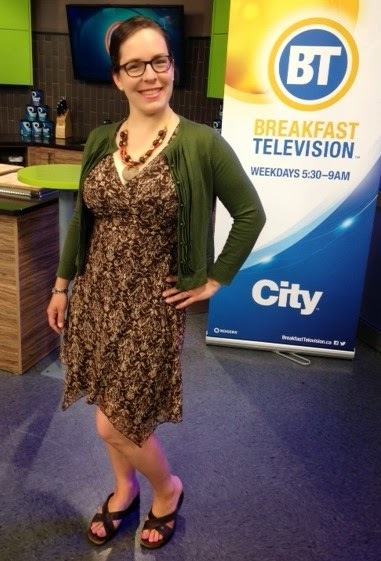 Thank you Nadine for coming on BT Bloggers Week modeling your second-hand style! You look great… even without accessories. I can admit it. Because I’m big like that. Have a wonderful time at the Good 100 Experiment! Maybe I’ll get more into accessories when he’s a little older. But I’ll still only wear one necklace at a time. And it’s a DENIM shirt. I don’t hold with all this fancy ‘chambray’ nonsense. Seriously, though, Nicole, I’m so happy to see you getting recognized for the great work you’re doing. Buying secondhand is such a powerful way to live The Do Gooder Lifestyle and be a more positive force in the world. And you’re right – it doesn’t matter which secondhand store you shop at. Hmmm, I have had THREE kids and somehow survive with dangly earrings and necklaces AND I’m a PEDIATRIC OT – so there you… you… do gooder!!! Thanks so much for coming on BTE with me yesterday! You looked awesome and were well-spoken as always! I hope more and more people will view second-hand shopping as viable, fashionable, do-able.